SCVHistory.com HS9301 | Newhall | Railroad Avenue: Freighter Delivering Boiler to Pico Oil Field, 1893? Freighter Oliver Lindsay "Bud" Taylor of Simi Valley and his crew stop in front of Judge John F. Powell's house on Railroad Avenue, Newhall, en route to delivering a boiler to the oil field in Pico Canyon. Boilers generated steam that powered the oil pumps in the years following the spring-pole extraction method. At far left is the side of Joshua "J.O." Newhall's general store (later Gulley and Swall), built in the 1880s at the northwest corner of Railroad Avenue and Market Street. 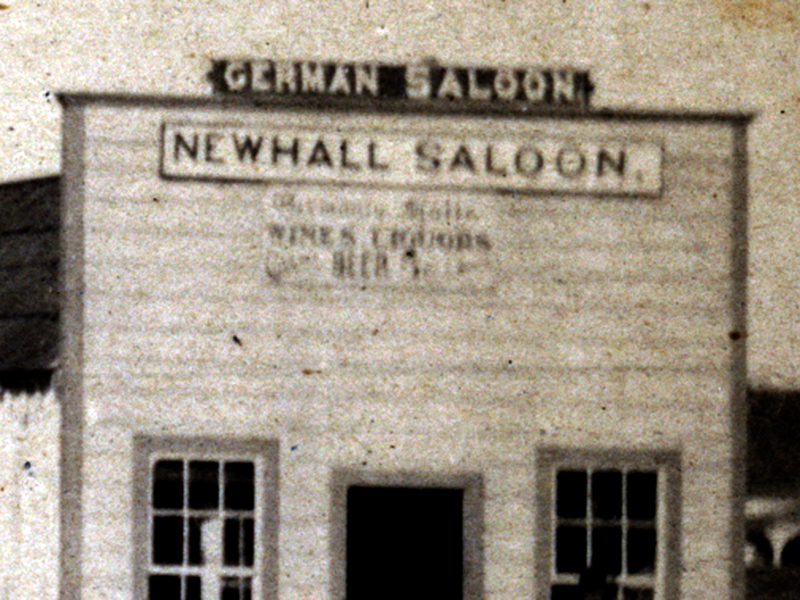 At right is a building identified as the "German Saloon" and "Newhall Saloon," about which we know nothing except that this location was Nick Rivera's Saloon by 1900. Nick Rivera's saloon looked different. Perhaps this German Saloon, which can also be seen in this 1887 photograph, burned down, or maybe Rivera simply didn't like the false front. We don't know. We do know there was a German presence in Newhall prior to 1900, considering that the general merchant George Campton was the local agent for the German-American Insurance Co. of New York. The house at farthest right might be Campton's home; we know his home sat near his store, which is out of frame. A born salesman, [Robert C.] McPherson had left Pennsylvania in 1873 ... and had come to California as an agent for Farrar & Trefts of Buffalo, New York, who were well-known manufacturers of steam engines and boilers. 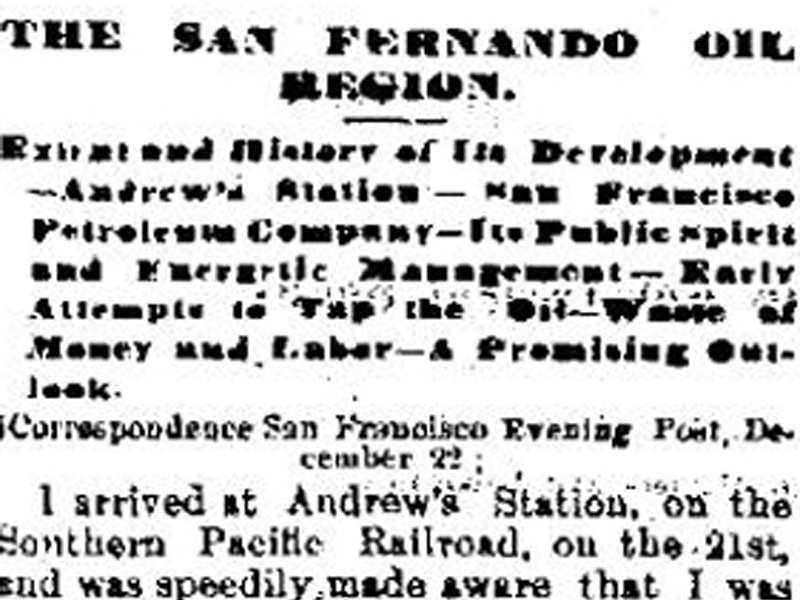 When he visited the Star Oil Works in the San Fernando [read: Pico] in June 1875, he may have been seeking to sell one of his engines. ... McPherson's rig, [which included] a 15-horsepower Farrar & Trefts engine, was by far the finest Californians had yet seen. He put it to work in early 1876 on the heights a scant half-mile east of Pico Springs. A half-mile east of Pico Springs would likely place it at the back of Pico Canyon, where Alex Mentry's Pico No. 4 discovery well was located. If "93.8.2" reflects something other than a date, can this be the "first" steam boiler used in Pico? The timing of construction of J.O. Newhall's general store (1880s) would suggest otherwise. Plus, how old would the freighter Bud Taylor have been in 1875-76? It should be noted there were other Taylors involved in the early Pico oil operations: Joseph Stevens Taylor, a vendor of fire-proof safes, who served as secretary of California Star Oil Works; and Frederick Bayard Taylor, a wealthy oil importer in San Francisco. Cameron reports the "move-away" year as 1874, but a later Simi Valley historian, Patricia Havens, states that Bud Taylor was still farming and ranching in Simi in 1875 (which he would also do decades later). The year 1877 makes more sense for the Taylors to have quit Southern California. The year 1877 was so dry that not only did crops die in Simi Valley, but the entire town of Newhall also pulled up stakes and moved two miles south to a water source. Cameron writes: "In 1877 Bud Taylor came to the [Simi] valley to stay," but this is questionable. In 1880 the Taylor family was living in Mono County, Calif., where Bud and Frank were making the run from Virginia City, Nevada, to Bodie, Mono County. [I]n 1884 there were only eight American adults in the [Simi] valley. ... Bud and Frank Taylor had been freighting from Virginia City to Bodie and they were known as top teamsters. They were dependable and would go anywhere. Just to add a few layers of confusion, back in January 1879, the Ventura Signal reported on the status of the Brown and Taylor company, a sheep and hog ranching operation run by Charles E. Hoar. 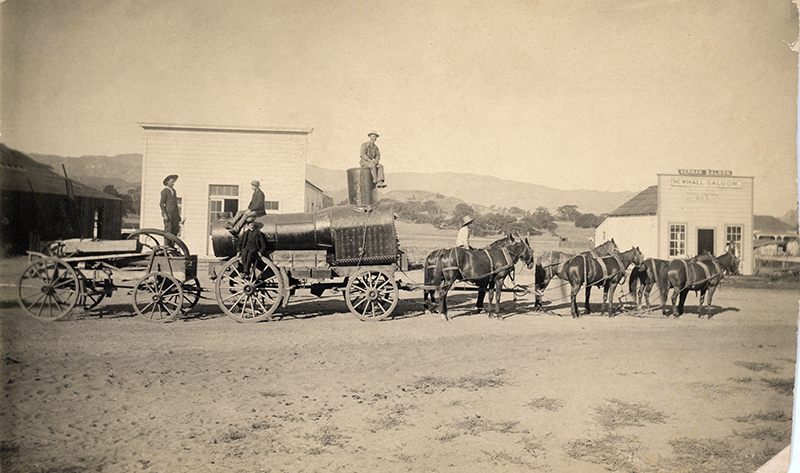 Hoar had boarded with the Taylor family in 1871 during their first sojourn in Simi Valley. At some later date, Hoar leased land to Bud and Frank Taylor, who went into the sheep ranching business with Albert William "Pete" Brown. We don't pretend to understand this. In January 1879, when the Brown and Taylor company was reported in the local paper, Bud Taylor would have been about 16 years old. Taylor went on to work as a freighter, sheep and hog rancher, and more. He died in Ventura County in 1937. 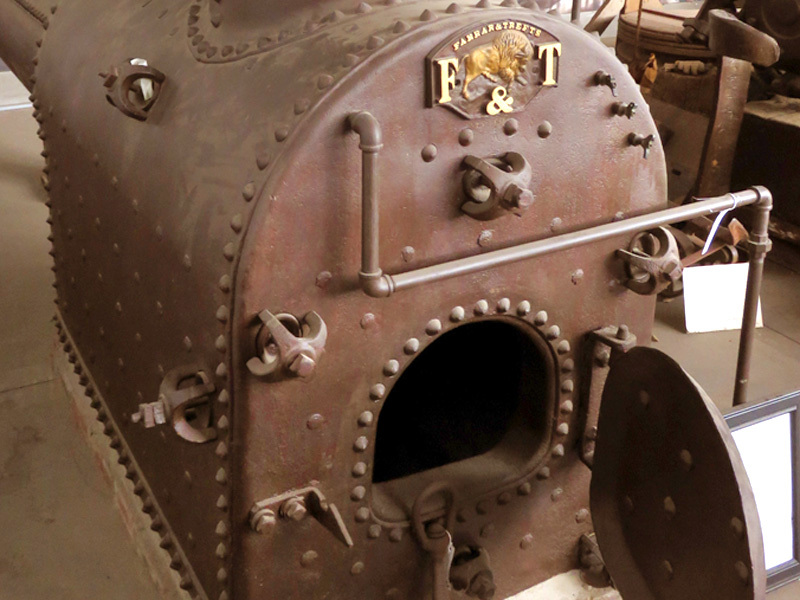 Can this be the first steam boiler used in the Pico oil works? We would have to say no. The buildings in the photograph did not exist in 1875-76 when the first steam-powered oil rig is known to have been used at Pico. Bud Taylor would have been about 13 years old in 1875-76, and we don't see a 13-year-old in the photograph. Can it be 1893? We would have to say yes. 1. Formative Years of the Far West, pp. 34, 36-37. 2. Carolyn Valdez, supra, personal communication, January 2019. 3. Cameron, Janet D. "Simi Grows Up." Los Angeles: Anderson, Ritchie & Simon, 1963. Pg. 12. According to Hampton (infra), Cameron interviewed Bud Taylor in 1928. 4. "Simi Valley From Many Sources" by Patricia Havens, May 1979. Published within "A Comprehensive Story of Ventura County, California," Arnold L. Murphy, editor. Oxnard: M&N Printing, 1979. Pg. 235. 6. Genealogical research by Tricia Lemon Putnam, January 2019. 7. Cameron, op. cit., pg. 14. 8. Hampton, Edwin Earl Jr. "Ventura County: The Garden of the World." Ventura County Historical Society Quarterly, Vol. 46, 2002. Pg. 100. Transcribed from the Ventura Signal, January 18, 1879. HS9301: 9600 dpi jpeg from archival tiff, courtesy of Simi Valley Historical Society & Museum.